The Funky Felter: A new local Kansas City area arts & crafts fair - the Power and Light District's Art Festival! 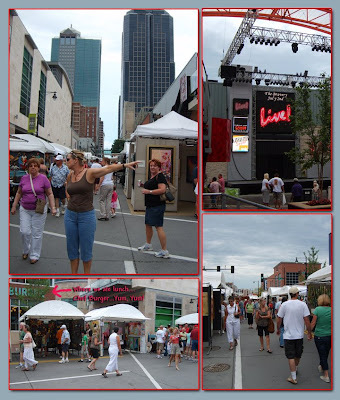 A new local Kansas City area arts & crafts fair - the Power and Light District's Art Festival! Over this past weekend, my husband and I attended an arts and crafts festival new to the Kansas City area. It was held in the Power and Light District (across from the new Sprint Center) and organized by ArtFestival.com, a family-owned business based in Florida. Although the traffic flow was not quite as packed as other large fairs around town, it was still hopping with activity and full of artistic talent and other family oriented things to do. And, considering it was an overcast day with showers off and on, it was a very busy, lively crowd. The new festival had a lot to offer. First of all, it was free! You can't beat that for a Saturday outing. It seemed very well organized, and the layout was easy to navigate and browse. I always find these events so inspiring as an artist. Although there were several unique arts and crafts represented, I was a little disappointed with this aspect. It seemed that there were a lot of painters, but I really wanted to see more variety. (Yes, there were some sculptors, fiber artists, glass artisans, woodworkers, etc. - just for the record.) I counted at least four painters with very similar styles that mimicked Pablo Picasso; one of which, who was so close in style that he seemed to almost be doing replicas. And, I was disappointed not to see more local area artisans participating. As I read each artist's information card hanging in their booths, I noticed only a few from the KC metro area, Missouri, or Kansas. I, as a local artist, didn't even know that this was happening until the weekend before when my husband mentioned that it was advertised in the newspaper. I'm not sure how widely advertised vendor submissions were here in KC? It would be so nice to see more local Kansas City area talent represented next year. Overall, I really enjoyed myself and all the wonderful artwork. I will definitely go back next year if it fits into my schedule. My husband chose where we ate lunch. He had seen a good review in the newspaper for a burger and hot dog place called Chef Burger, and its menu was very reasonably priced. I was thinking that it would just be a cheap burger joint and was fine with that, but I was pleasantly surprised. Their food was really great, and the portions were generous too (not that I need generous portions!). My husband and I both ate for less than $20 which I think is a very good deal! It was a family-oriented place too for those of you with munchkins. We ate in the small patio area and were surrounded by families with small, well-behaved children. All-in-all a pleasant and yummy dining experience! I recommend it if you're in that area and in the mood for a really good burger.